Hi, everyone! 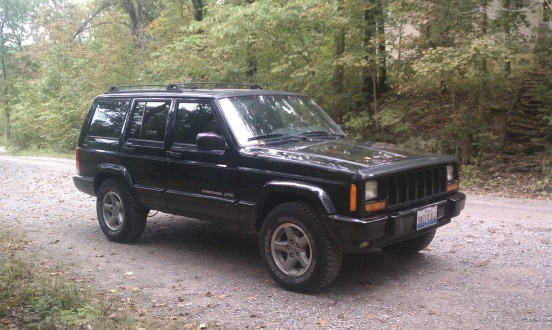 I had my 1999 Jeep Cherokee Classic stolen from E. 32nd Street in Chicago sometime last night (Feb. 13) or this morning/afternoon (Feb. 14). It's black, four-door, trailer hitch (receiver), and luggage rack, license plate SMILY V 2. It has a small red sticker on the rear window (driver's side) that is a parking permit for SIUC, a dog seat belt attachment on the front passenger side seatbelt, and lots of dog nose prints on all the windows. There was a big rubbermaid tub in the back with a snow shovel and such in it, and the back seat was folded down, as usual. I filed a police report this evening when I discovered it was missing. I know I haven't much hope of getting it back, but I thought it wouldn't hurt to at least post a quick note here. Photo attached. I love my Jeep! Good luck with your recovery...gotta love Chicago. Keeping my eyes open. Feel free to post at ddoffroad.com in our general discussion thread. The more eyes looking for it the better. Done! Thank you for the suggestion! I hope so, too! Thank you! No, no luck yet. I'm rather sad.Thank you for asking, though! id post on naxja as well as jeepforum too!!! got my eyes out. id check cl for part out every day. and call local salvage and scrap yards and let them BEWARE even if its cut in half a car has many vin numbers on it. and can be found some are even good through fires. Any luck on finding the jeep? ?? Could just mean they used the same image..